Water heaters are one of the most important component of any plumbing system. You depend on your water heater throughout the day to dispense hot water for showers, washing your clothes and dishes, and so many other uses. When your oht water heater breaks down it can cause disruption for your entire family. 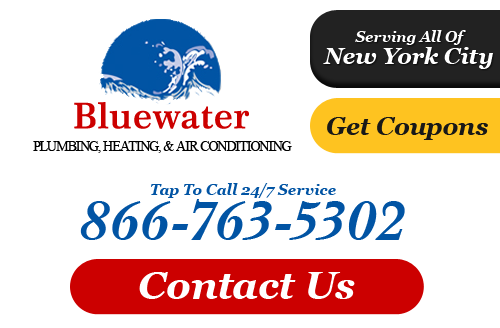 At Bluewater Plumbing, Heating, and Air Conditioning we provide practical solutions for your water heater issues that range from full installation and replacement to common repairs and ongoing maintenance. 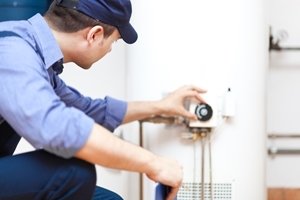 When it comes to water heaters in Queens, no one bests our plumbers on repairs, replacements and installations! If you are moving into a new home or need a water heater replaced, we offer full water heater installation on all units, and all brands. If you are not sure what type of model is best for your home or office, then we can help you. It is important to get the right size water heater that can provide enough water for all the occupants on your property. This insures that your system will ruin efficiently, and that you will always have enough water. There are many great options available to you, and installation is quick and easy when you choose Bluewater Plumbing, Heating and Air Conditioning as your preferred Queens plumber. When your water heater breaks down, it's important to have it repaired by certified professionals who have experience repairing all water heaters. This is insures that the job is done right. Our water heater repair service covers all issues. Regardless of how big or small the job is or what type of water heater you have, we can fix it in no time. We provide prompt water heater repairs in Queens that are reliable and affordable. We provide fair and accurate estimates, and our rates for heating services in Queens are competitive. One of the newest and most revolutionary water heating systems on the market today are tankless water heaters. There are numerous advantages of tankless water heaters over traditional storage tank water heaters. They provide on-demand hot water. There is no more wasting water while you wait for it to turn hot. Tankless water heater provide instant heated water as soon as you turn on the knob. Another great benefit is that tankless heaters never run out of hot water, because they do not rely on a reserve tank. They convert cold water into hot water as it passes through the unit. Tankless heaters also run more efficiently and are easier to install than stand water heaters. Interested in making your water heater replacement a tankless model? Give our plumbers a call today! We'll be happy to provide you with more information as well as estimates on the top rate water heaters we carry, all from reputable manufacturers. For repairs, installation or an estimate for water heaters in Queens, please call 866-763-5302 or complete our online request form.